These companies need to be taken down, Warren says, because they buy up possible competitors (consider Facebook's 2012 purchase of Instagram, a photo-sharing application)and, in some cases, because they crush small businesses by directly competing with those businesses on their platforms (for example, when Amazon offers its own branded version of a product another company is selling on Amazon). Her solutions? First, pass legislation that would label any large tech company a "platform utility" that would be "prohibited from owning … any participants on that platform." This means Amazon couldn't sell its own branded widgets on Amazon and that Google couldn't set up its own comparison shopping service while demoting competing shopping services in its search results. In 2017, Google was fined $2.7 billion by the EU for doing exactly that. 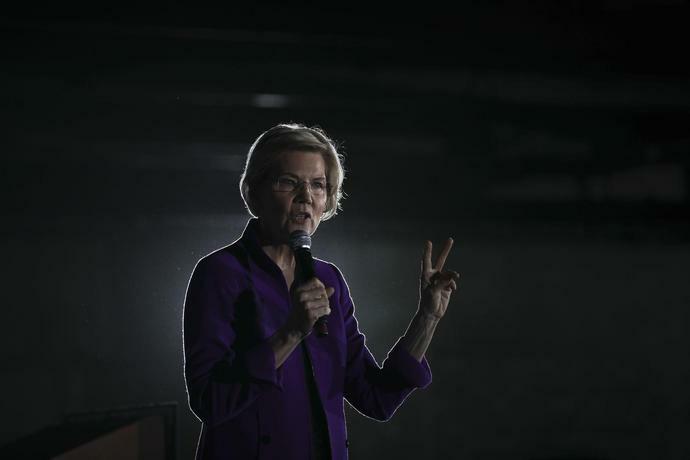 Second, Warren wants to appoint "regulators committed to reversing illegal and anti-competitive tech mergers." But we already have such regulators - antitrust officials at both the Federal Trade Commission and the Department of Justice. They might have been asleep at the wheel when it comes to Big Tech, but they seem to be waking up. In late February, the FTC announced that it had formed a task force to scrutinize Big Tech, and, yes, it will also look specifically at past acquisitions and mergers. That's all she wrote, which is far from enough. Warren's first mistake was to throw Amazon and Apple into the same pot with Google and Facebook. Apple sells actual projects that it manufactures, and Amazon is a highly efficient distributor of actual goods - a digital version of Walmart. Meanwhile, Walmart is gearing up at this very moment to challenge Amazon in cyberspace. Unlike monopolies that raise prices at will (think: modern pharmaceutical companies), Amazon, like Walmart, has been lowering prices, which makes it a questionable candidate for antitrust actions. Other than being big and techie, Google and Facebook are nothing like Amazon and Apple. While Amazon, Walmart, Microsoft and Apple sell actual products, Google and Facebook do something very different. They sell you, me and our kids to advertisers, while pretending to be benign providers of an endless array of "free" services - services that we pay for with our data and our freedom. Google, Facebook and the growing phalanx of companies that are emulating them rely on a surveillance business model that Apple's Tim Cook has called "creepy" and that retired Harvard professor Shoshana Zuboff expertly exposes in a new book. Google and Facebook pose three grave threats to democracy and human freedom: fine-grained surveillance of billions of people around the world, the ability to determine what information those people see and don't see (the censorship problem), and the ability to manipulate people's thinking, behavior and votes without them knowing they're being influenced. The latter problem, which I've been studying through both monitoring projects and controlled experiments for more than six years, troubles me most, but all three of these problems are serious. I'm now studying and quantifying seven different methods these companies can use to shift votes and opinions on a massive scale, and I'm aware of other subtle manipulations that still need to be studied. Warren's proposal doesn't even begin to address these threats. Her proposal is so far off the mark, in fact, that it makes me wonder whether she's actually trying to help these companies rather than contain them. Google is one of her largest donors, and she has also received substantial donations from employees at three of the companies she wants to regulate. People tend not to bite the hand that feeds them. Either Warren is playing a subtle game, or she just doesn't get it. She even reassures us that after her new laws and regulations have cleaned up these companies a bit, the surveillance will continue unabated: "You'll still be able to go on Google and search like you do today," she says. "You'll still be able to go on Facebook and see how your old friend from school is doing." She implicitly recognizes but doesn't address the real problem: You can't disempower Google's core monopoly because you can't dismember its search engine. If you did, each of the remnants of that search engine would give you inferior results. And you also can't disempower Facebook's core monopoly because you can't dismember Facebook's social network platform. Doing so would be like erecting an über version of the Berlin Wall, splitting millions of families apart irreparably. Even if Gmail, Chrome, and Android were spun off from Google, and even if Instagram and WhatsApp were spun off from Facebook, the ravenous bellies of the beasts - Google's search engine and Facebook's social network platform - would continue to give these companies unchecked power the likes of which no dictator on earth has ever had. Can anything be done to curtail such power? Yes, and many well-informed people are working on the problem - among them Sir Tim Berners-Lee, the inventor of the World Wide Web; Roger McNamee, an early investor in both Google and Facebook; and Tristan Harris, a former "design ethicist" at Google. As for Warren, her proposal is not only toothless, it also suggests that she doesn't understand the nature of the threat we face.